It seems as though the term “destination wedding” has been flooded with so many beachside celebrations that our minds go directly to the sandy shorelines first. But, there are so many other options that could work for your wedding ceremony – ones that you may have not even considered before – right here in the U.S.A! From the mountains to the metropolitan cities, there are a host of places to take your I do’s. So, let’s dive into some fun ideas that could crank up the imagination a little bit in terms of your location. If you’re planning a getaway for your big moment, why not do it in a way that’s more unique than the usual Bahamian party? These locations have so much fun to offer up outside of all of the beautiful ceremony venues. From hiking the Grand Canyon to grabbing tickets to some of the world’s best amusement parks, you’ll be exchanging vows and pocketing adventurous memories all-in-one. Live your live really on edge by saying your “I do’s” near one of the seven wonders of the world. It doesn’t get more adventurous than this deep escape! And just imagine all of the insanely stunning photos you’ll be able to take of your big day. DIY photo booths and backdrops won’t be needed when you have the Grand Canyon right up your sleeve. All you need is a permit – granted through Grand Canyon National Park – to begin your planning as the park accepts weddings throughout all four seasons. There are a few options for lodging if you want to be close by the canyon itself, just check out the Thunderbird Lodge for some ideas and pricing! A gorgeous destination, a once-in-a-lifetime adventure, Hawaii is one of the most sought-after vacation spots in the world, and that makes it one of the best places to get married too, of course! With insanely beautiful beaches, clear, blue waters and tons of adventures on the island, you’ll be able to host an amazing event and set out and explore the islands once the party dies down. Honolulu is on the island of Oahu and also the home of Waikiki Beach, it’s also got the biggest airport making it a more convenient stop for a lot of out-of-town guests. Check out The Modern Honolulu for some inspiration behind setting a date here! A gorgeous venue to start off your brainstorming and a peek into the beauty of this U.S. location is with Diamond Cross Ranch. Fixated in the heart of the Grand Tetons – with Yellowstone National Park closeby as well – you get breathtaking views of the mountain range and a lot of options for adventure within this city. Maybe your adventurous spirit is revved up by the hustle and bustle of a big city. If that’s the case, why not check out Chicago and all it has to offer? Grab some ideas at theWit Hotel for insight on venue pricing and options. In the meantime, take in the views of the city, the history, the culture and indulge in as much of the arts and entertainment of every nook! Not to mention, Lake Michigan is nearby creating even more opportunity for incredible photos and romance. We know that Orlando is home of Disney World and the fairy-tale weddings that come out of there are insane, but that’s not the only option there is for our most fun-loving couples. It’s also home to other incredible venues like The Waldorf Astoria and Rosen Shingle Creek. This city just has so much to offer. Create an outdoors escape near the marshes – and take an airboat ride while you’re at it. Spend time in the countless amusement parks around all while having fun and celebrating your nuptials with family and friends! Aspen is known for its incredibly skiing and snowboarding opportunities, so why not give that a go on your escape as well? While you’re at it, check out some of the most beautiful mountain views and snow-covered scenes at venues like The Little Nell and Hotel Jerome. You have the option of gathering the elegance of the city with the natural, organic serenity of the mountains while in Aspen. And the resorts are year round, making even the chilliest of celebrations some of the most spectacular. Anything that’s named “Death Valley,” should at least be seen by those filled with adventure, don’t you think? And if you had an opportunity to be wed there, wouldn’t you take it? Because you can, and it’s stunning! The canyons here provide an intimate, romantic space to share your ceremony but it’s also got an even greater mysterious vibe that creates an unusual and unexpected atmosphere. There are a host of more traditional spaces nearby to accommodate guests though, like the Mountain Falls Golf Club. Serene, gorgeous and well-known, these are the American locations that set the scene for the most gorgeous of weddings. Classic, elegant and sophisticated too, from the bright lights of NYC to the rolling hills of Napa Valley, no choice on the list is a bad one. Magnolia Plantation and Gardens gives a beautiful representation of the stunning scenery and romance Charleston has to offer. If you want an even clearer example, just think about a Nicholas Sparks book. You can put yourself right inside the story by using this southern destination as your wedding day location. Live oaks, Spanish moss, cobblestone streets, the coast, rich history, there’s so much to see, do and experience inside of the city. And there are so many stunning venues that will offer up the right kind of space to fit your vision. For a more subdued feel with a lot of romance and effortless style thrown in, think about checking out one of the more underrated cities on the list; Portland, Maine. Picturesque views of the water and a shot of metropolitan life, The Westin Portland Harborview is a good spot to make it all come to life. Between the historic Arts District downtown all the way to Casco Bay, you’ll have a variety of things to do before the party gets started and after the party dies down. You’ll definitely be able to plan a celebration here under all kinds of budgets and styles – and all of them include the serene quality that the city has to offer. Getting married among the vineyards seems like quite the dream, doesn’t it? Actually, Marriott Napa Valley Hotel & Spa seems to be a dream location as well and provides a good example of the types of accommodations you can find in this neck of the woods. There’s a certain charm that this part of the country has to offer; European flair, romance, sophistication and organic beauty all come together to create a unique event filled with memorable moments and scenes. Explore wineries, immerse yourself in “foodie” nation and enjoy your downtime throughout your wedding celebrations. Another spot filled with whimsy and romance, Sea Island, Georgia – part of the Golden Isles of Georgia – may not be one of the most well-known destinations but it sure offers up its fair share of magic. Check out some of that magic over at The Cloister Garden. This coastal, southern location is filled with so much charm, you’ll love the connection between hospitable people and a splash of Atlantic life. There’s also five miles of private beach for you to enjoy as well as championship golf courses. If you want to get married in a sophisticated, metropolitan city swimming in culture and life, then The Big Apple is exactly where you need to be. Gorgeous skylines, a host of amazing venues to choose from – like the Morningside Castle – and so many things to do and see for both you and your guests, it’s a win for everyone. At any corner you can find rich history, modern nuances or a new experience to add to your highlight reel. You haven’t lived until you have experienced this city, and what better way to do that than to be married while you’re at it? If you like that quiet, beachside charm, then you’ll definitely fall head-over-heels in love with this location. Scenic backdrops, beach ceremonies and lobster on the menu, immerse yourself in the culture of the city for the entire celebration. Park City, Utah is stunning, especially when there’s snow on the ground. Use that to your advantage! Here too you’ll have stunning views and a more subdued, classic style. 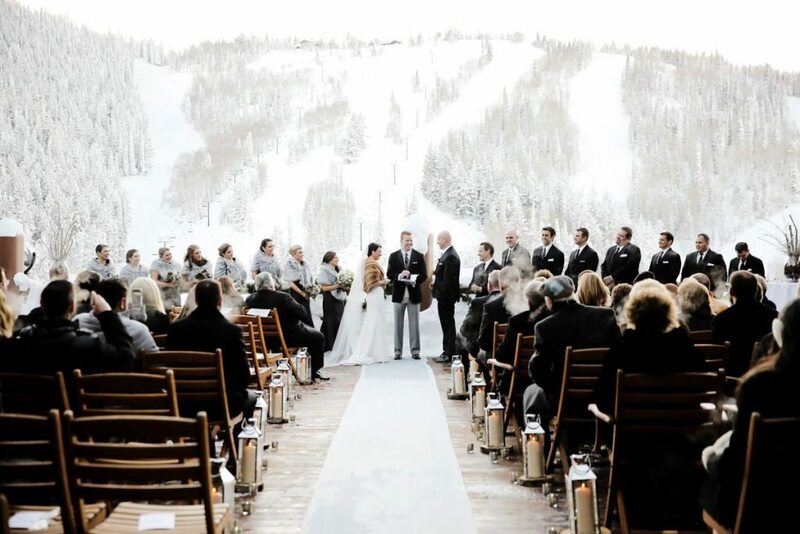 If you’re a fan of natural beauty, Deer Valley may be a venue for you to take a second look at when it comes to a Park City wedding. Photos on the ski lift, candlelit ceremonies in front of the alpine background and embracing all of Mother Nature’s beauty, it’s such a gorgeous destination to celebrate in. For trendier couples that like to try new, outside-the-box things and places, this list is for you. Roam Nashville finding new eateries and live music at every turn or hole up in a gorgeous cabin in funky, downtown Denver, these spots have some unique options too! Seattle is known for its offbeat nature and foodie fandom. It’s also got a beautiful skyline and a lot of great options concerning ceremony venues – like that of Loews Hotel 1000. Within the city you’ll be close enough to Elliot Bay while easily being able to check out the famous Pike Place Market or Seattle Art Museum – all great locations to say your “I do’s” as well. And the weather, filled with clouds and bouts of rain, may not be ideal (although rain is considered good luck on a wedding day) it adds to the funky, mysterious personality this city has organically adopted. If you’re looking for something a bit outside-the-box in terms of destinations for your “destination wedding,” look here! One of the fastest growing cities in the country, Nashville is the newest “it” spot not only for tourists but for weddings too! With a plethora of venues and funky spots to experience, you’ll love the southern charm and hipster vibes you’ll be getting in this downtown experience. But at any turn you’ll be able to find something that fits your vision. Experience the country at Loveless Barn or celebrate downtown at the Country Music Hall of Fame. Either way, you’ve got to make sure that some Nashville hot chicken makes it onto the hors d’oeuvre list. Maybe your couple style is more of the “life of the party.” If so, why not throw one of the biggest parties ever down in New Orleans? This city truly has a life all its own, which is taken up a few notches once the sun goes down. And every part of the culture you can dip your wedding festivities into. From the rehearsal dinner to the reception, there will be a way to incorporate some jazz music, crawfish and po boys, as well as some of that old southern charm. The Degas House is a nice spot to check out if you’re looking around at options. San Francisco has a lot to offer up as well. Eclectic styles swirl around the city and there’s so much to do! Have dinner at the Fisherman’s Wharf, use the Golden Gate bridge as a natural backdrop to your photos and travel to Muir Woods in your downtime for some one-on-one interaction with nature. You truly get everything you could want within this city – even the beach! For something a little more upscale, The Sir Francis Drake Hotel is a stunning venue option. Parkside Mansion may be your ticket to one of the coolest Denver weddings around. But overall, you have a lot of options to consider when researching this city, but most importantly it’s the beauty surrounding it that will take your breath away. You’ll have the Rocky Mountains in your view but there’s also a bustling and vivacious metro area to consider as well. The city is also located near an airport making the plans of out-of-town guests a bit easier to manage. Rustic, warm and filled with sunshine, you’ll love the brightness and youthful appeal of an Austin, Texas wedding. Also, we hear the music scene there isn’t too bad either. Tuscan Hall & Veranda Room gives a lot of beautiful ideas to consider, but there really are so many different kinds of venues to choose from. Country or vintage, upscale and modern; the vision is up to you but know that you’re getting so much more than just a space. You’re getting the chance to experience Texan cuisine, southwestern flair and intimate settings. If you’re looking into Louisville for your wedding destination, you may surprise yourself. Not only are you giving yourself a chance to exchange vows at the historic Churchill Downs but you’re giving your guests the opportunity to sip on some of the best mint juleps they’ve ever had. Aside from what’s so closely associated to the city, there’s more than meets the eye to this Kentucky locale. There’s a lot to see and do here too. Check out the Louisville Slugger Museum and Factory, the Mega Cavern as well as the Muhammad Ali Center while you’re there.